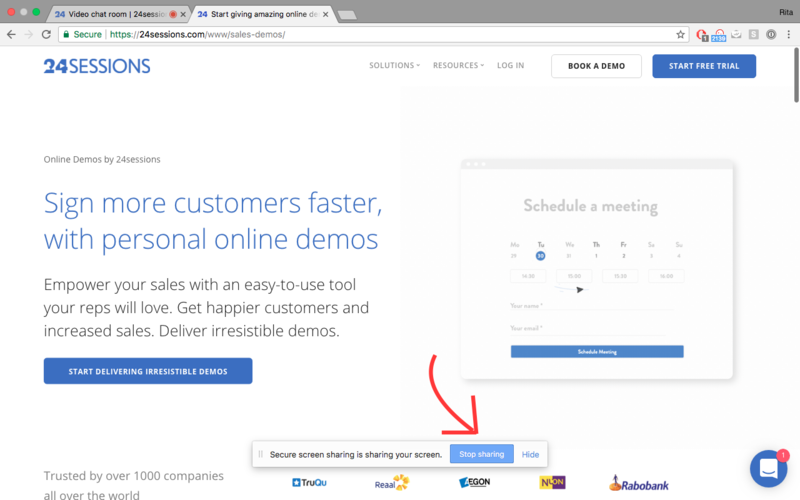 Enter the meeting room by copy / pasting the meeting room URL in Google Chrome, Firefox or Safari 11+. When you enter the meeting room you can test/edit your media settings, share your screen, invite guests, switch to "audio by phone", exchange messages/files via the chat and the list goes on! Click on the camera icon to turn your camera on/off. Click on the microphone icon to turn your microphone on/off. (This is very useful for meetings with more than two participants where you don't want exterior noises to interfere 😉). Click on the gear icon to manage your media settings (video/microphone/sound). 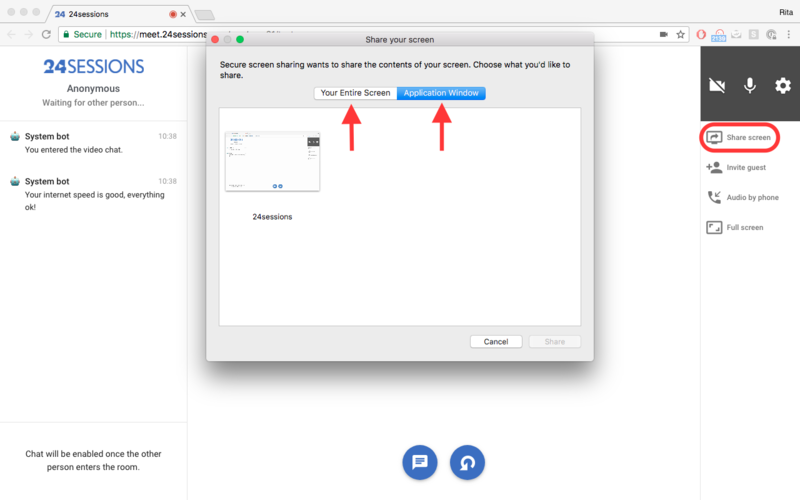 Share your entire screen with your guests. Share only what's in the application window. You can stop sharing your screen either by clicking on the icon on the left of the screen or the button at the bottom. (The latter is to remind you that you're still sharing when you're navigating "outside" the meeting room). Please note that remote control is not possible through screen share. 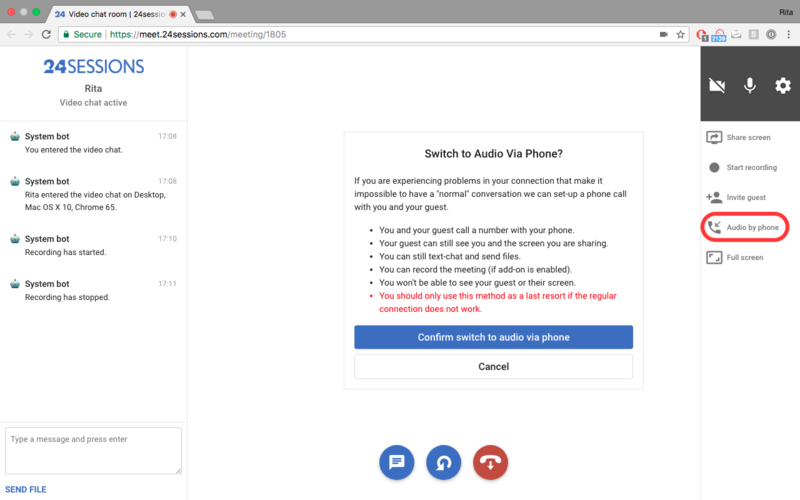 With recordings you can track and improve performance, take notes and send audio files to your customers. 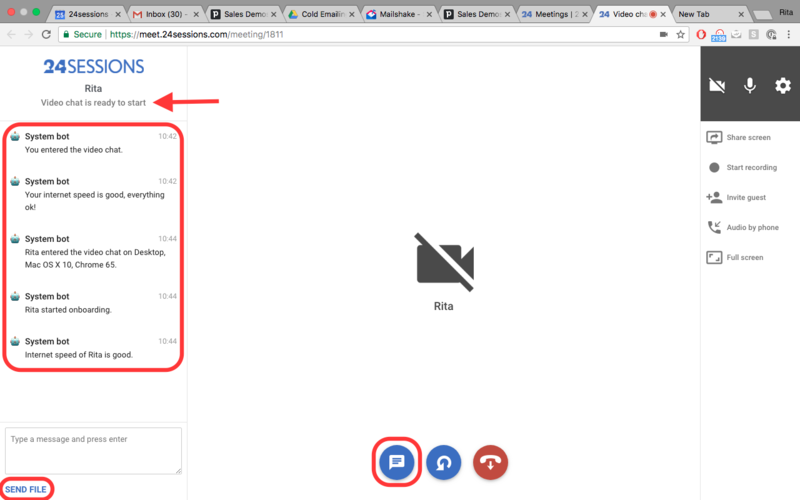 To record your video meeting click on the "Start recording" icon. For a detailed description on how "Recordings" work check here. 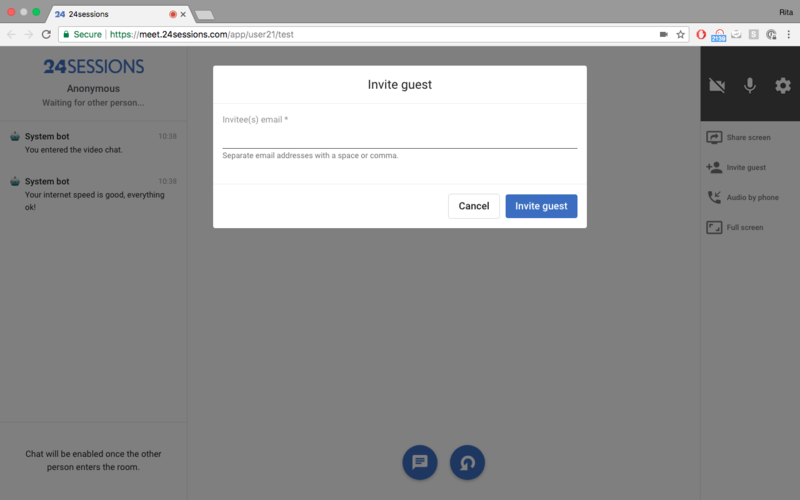 Invite more guests to the meeting room only by adding their email address. They'll immediately receive an email with the link and code to enter the meeting. This is the fall back option when the connection gets interrupted out of a sudden. Switch to your phone whilst still in the video room where your client can still see you or your shared screen. For a detailed description on how "Audio by phone" works check here. Ideal if you want your video room to occupy your entire display. Press "esc" button if you want to go back. 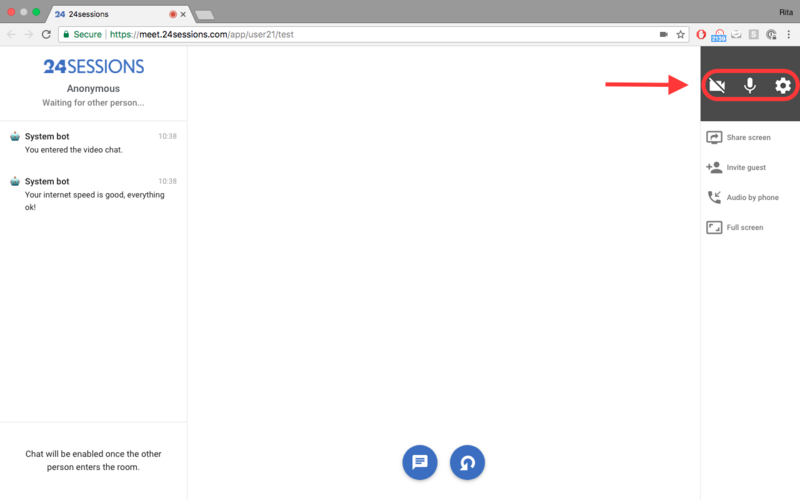 Chat allows you to exchange messages and files with your guests. 24sessions bot shows when the client starts with the device check. Chat is enabled as soon as the other person enters the meeting room. Tip: You can remove the chat from your screen by clicking the chat icon at the bottom. If you want to refresh your page whilst in the meeting room click on the refresh button at the bottom of the screen.